Next ArticleNew Purchase: Tupac Tee. A lot of girls have been asking me to do a blog post about how I manage to keep my hair healthy so thought I'd do it today so we can all go into the new year with new hair products lol! My hair is relaxed and I perm it once every three months and in between I get it washed and treated every three weeks. Because I'm forever getting my hair done on jobs I don't like going to the hairdressers as often as I used to because I like to give my hair a break from heat. Earlier this year when I did my hair job in Thailand, viagra visit my hair was cut by around two inches and dyed with permanent hair dye so I used these products to nurse it back to health! Below is a list of my favourite hair products which I feel keep my hair healthy and shiny, page approved hope you enjoy! 1. Amla Jasmine Oil. This is one of my favourite hair products for daily use on the ends and body of my hair as it is light yet nourishing and moisturising- I find some products can be really thick and greasy which can make the hair harder to style. When I was younger my grandma used to use Jasmine oil to treat my hair; she would put literally half a bottle in my giant afro and steam my hair before washing it out. If your hair is particularly dry you can use this product to steam your hair but you would need to wash it out. There are many different brands of Jasmine oil and I guess they'd all be the same- mine is available in most black hair shops. 2. 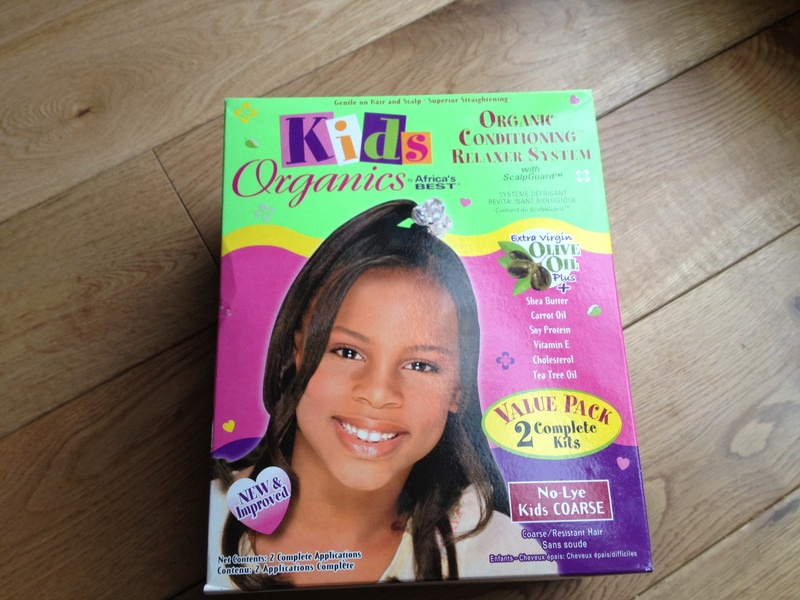 Organics Kids Relaxer Kit. I ALWAYS use a kids relaxer in my hair and so does my mum. I have only used an adult relaxer twice when I forgot to bring my own kit to the hairdresser and I really didn't like the results! It made my hair feel brittle and thin which is very unlike my hair; my hair is really thick! Whenever I use adult relaxer I always get a burnt scalp which really isn't good where as the kids perm is more gentle on both my hair and scalp. It always comes with the neutralising shampoo to which will completely stop the perm from breaking your hair down. 3. Olive Oil Shampoo and conditioner. When it comes to shampoo and conditioner I'm not really fussy; I use either Aussie Miracle Moist shampoo and conditioner or Olive Oil Shampoo and conditioner. I then mix the conditioner with my next product to treat/ steam my hair. 4. Loreal Extraodinary Oil. I love using this product mixed with a regular conditioner to steam/ treat my hair as it leaves it so soft and silky! This product can be used by all hair types and is available at boots and other good retailers. 5. 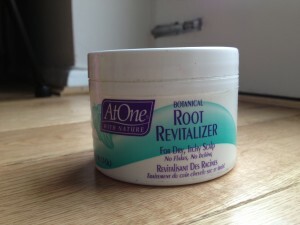 At One Root revitaliser. I use this product on my scalp and hair line and I love it because it contains menthol and leaves a lovely tingly feeling! I use it on my hairline everyday and my scalp once or twice a week depending on how dry my hair is feeling. This product is also very light and doesn't build up in the hair. It helps so much with breakage; I used it once a day for my hairline when I experienced some breakage after my hair job. 6. Castor Oil. Castor Oil is hailed by many as a great product for growing hair. I only use it on my hair when my regrowth os much thicker- never freshly permed hair. This product is extremely thick and gooey so I would never use it on fresh hair as it would make your hair so sticky and hard to style! 7. 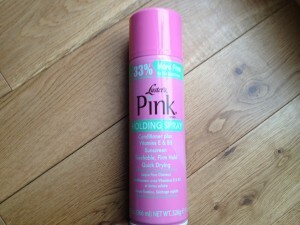 Lusters Pink Hairspray. When it comes to modelling my hair goes through a lot especially during fashion week. The way I've managed to maintain my hair is because of this fantastic hairspray by Lusters! I do not know what I would do without it! Its strong enough to hold my hair but gentle enough for me to brush out without and difficulties! Most hair sprays are too strong for black hair and I've experienced some hairsprays gluing my hair together and having to be soaked out! This hairspray is light and contains a bit of oil so my hair doesn't get to dry and brittle. If a hairdresser needs to make it stronger they simply use a warm hairdryer to get rid of the oil. A lot of girls have been asking me to do a blog post about how I manage to keep my hair healthy so thought I'd do it today so we can all go into the new year with new hair products lol! My hair is relaxed and I perm it once every three months and in between I get it washed and treated every three weeks. Because I'm forever getting my hair done on jobs I don't like going to the hairdressers as often as I used to because I like to give my hair a break from heat. Earlier this year when I did my hair job in Thailand, viagra visit my hair was cut by around two inches and dyed with permanent hair dye so I used these products to nurse it back to health! Below is a list of my favourite hair products which I feel keep my hair healthy and shiny, page approved hope you enjoy! 1. Amla Jasmine Oil. This is one of my favourite hair products for daily use on the ends and body of my hair as it is light yet nourishing and moisturising- I find some products can be really thick and greasy which can make the hair harder to style. When I was younger my grandma used to use Jasmine oil to treat my hair; she would put literally half a bottle in my giant afro and steam my hair before washing it out. If your hair is particularly dry you can use this product to steam your hair but you would need to wash it out. There are many different brands of Jasmine oil and I guess they'd all be the same- mine is available in most black hair shops. 2. 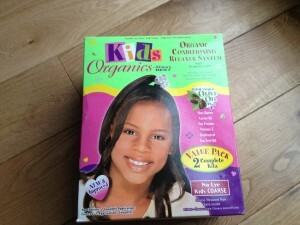 Organics Kids Relaxer Kit. I ALWAYS use a kids relaxer in my hair and so does my mum. I have only used an adult relaxer twice when I forgot to bring my own kit to the hairdresser and I really didn't like the results! It made my hair feel brittle and thin which is very unlike my hair; my hair is really thick! Whenever I use adult relaxer I always get a burnt scalp which really isn't good where as the kids perm is more gentle on both my hair and scalp. It always comes with the neutralising shampoo to which will completely stop the perm from breaking your hair down. 3. Olive Oil Shampoo and conditioner. When it comes to shampoo and conditioner I'm not really fussy; I use either Aussie Miracle Moist shampoo and conditioner or Olive Oil Shampoo and conditioner. I then mix the conditioner with my next product to treat/ steam my hair. 4. Loreal Extraodinary Oil. I love using this product mixed with a regular conditioner to steam/ treat my hair as it leaves it so soft and silky! This product can be used by all hair types and is available at boots and other good retailers. 5. At One Root revitaliser. I use this product on my scalp and hair line and I love it because it contains menthol and leaves a lovely tingly feeling! I use it on my hairline everyday and my scalp once or twice a week depending on how dry my hair is feeling. This product is also very light and doesn't build up in the hair. It helps so much with breakage; I used it once a day for my hairline when I experienced some breakage after my hair job. 6. Castor Oil. Castor Oil is hailed by many as a great product for growing hair. I only use it on my hair when my regrowth os much thicker- never freshly permed hair. This product is extremely thick and gooey so I would never use it on fresh hair as it would make your hair so sticky and hard to style! 7. Lusters Pink Hairspray. When it comes to modelling my hair goes through a lot especially during fashion week. The way I've managed to maintain my hair is because of this fantastic hairspray by Lusters! I do not know what I would do without it! Its strong enough to hold my hair but gentle enough for me to brush out without and difficulties! Most hair sprays are too strong for black hair and I've experienced some hairsprays gluing my hair together and having to be soaked out! This hairspray is light and contains a bit of oil so my hair doesn't get to dry and brittle. If a hairdresser needs to make it stronger they simply use a warm hairdryer to get rid of the oil. As some of you know I set up a competition for my subscribers! I asked them to tell me what they like about Cracked China Cup and what they would like to see more of and I picked my winner based on how informative I found the answer. I was shocked at how many entries I had and so happy that so many readers enjoy so many aspects of my blog and I really loved the suggestions to better my blog. The prize was a Topshop voucher, order Mac Mean and Green nail polish, more about Seche Vite Top Coat and my favourite facial wash! It was so hard to pick a winner but I decided 15 year old Leyla Ali! Here is here entry below :) What do you like the most about Cracked China Cup? Well this took me a long time to decide because there are so many things that I love about Cracked China Cup and my simple answer would just be everything! But if I had to be more specific, cure it would have to be the day to day life posts you do because I am currently obsessed with models and their everyday life events. I like how you just tell people how it is and you don't dress up your life to be something it's not. Your day to day life posts are like little diary entries and I really look forward to them, in fact your whole website has inspired me to create a blog of my own(it's not quite ready yet). I like that your website isn't really formal, it's quite chatty and really easy to navigate. Oh and I think your website name is really cool and catchy. What is your favourite post on Cracked China Cup? 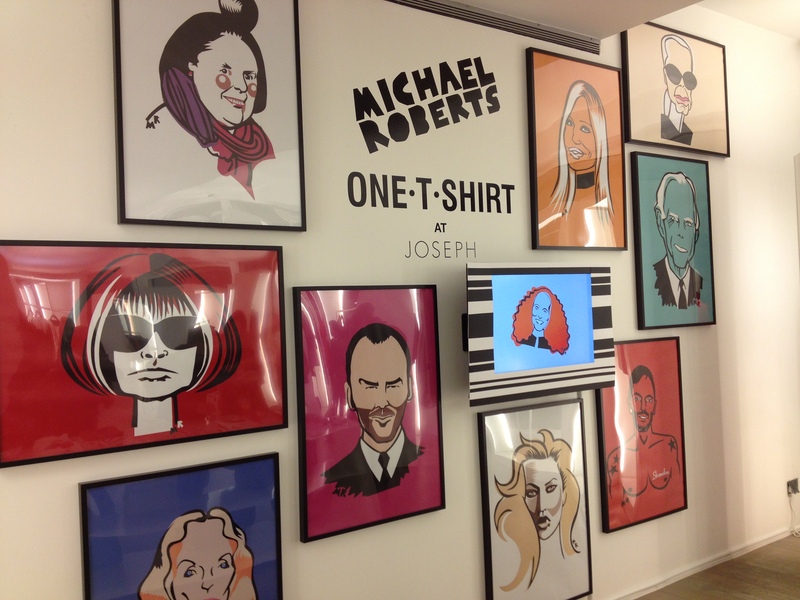 My favourite post is Top Ten Modelling Myths! 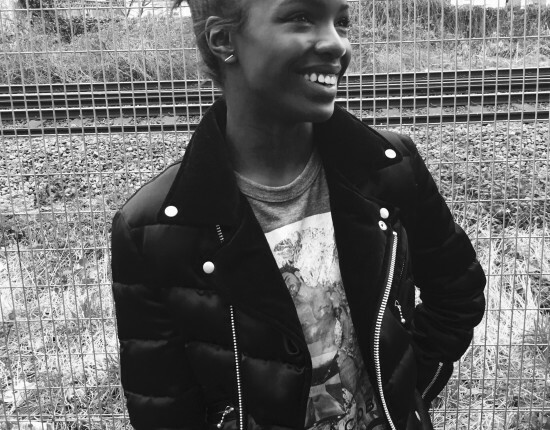 I love this post because it's very honest, I've been obsessed with fashion and modelling for as long as I can remember and I hear so many lies about modelling that it frustrates me to even listen because I am so passionate about it, so basically I like that you have set the record straight and told the truth. I also like that you've made it funny too. In this post you talk about being 'naturally slim due to genes' and I am so glad people can read this because I am also really slim and people constantly tell me to eat more and I've been asked if I am anorexic so many times, so this was really reassuring to know that I am not the only one(even though I'm not a model lol). You mention Marc Jacobs and this just made me love this post even more as he is one of my favourite designers which is funny because I only found out about him from when you were on The Model Agency. What would you like to see more of on Cracked China Cup? I would like to see more outfit of the day posts in the 'My Wardrobe' area of your website as you only have 3 different oufits on display. Maybe a post about all the different designers you have worked with in the past would be good too! I'm not sure if you have done this already but a post a about how you look after your hair would be interesing as well. I loved so many of the entries! Gabriella Tavani said she would like to see "a video from a trip to premier and head shots and polaroids." Lara forrest had an amazing idea of getting a subscriber to interview me and also do a Q&A session through my subscribers- definitely going to do that so get subscribing! Rennee Yamaekye enjoyed my eBay Haul video and a lot of people enjoyed my online shopping video! I've taken on board all of your suggestions and you will definitely be seeing some of your ideas in my blog next year! Thank you so much and I will be doing some more subscriber based competitions! A lot of girls have been asking me to do a blog post about how I manage to keep my hair healthy so thought I'd do it today so we can all go into the new year with new hair products lol! My hair is relaxed and I perm it once every three months and in between I get it washed and treated every three weeks. Because I'm forever getting my hair done on jobs I don't like going to the hairdressers as often as I used to because I like to give my hair a break from heat. Earlier this year when I did my hair job in Thailand, viagra visit my hair was cut by around two inches and dyed with permanent hair dye so I used these products to nurse it back to health! Below is a list of my favourite hair products which I feel keep my hair healthy and shiny, page approved hope you enjoy! 1. Amla Jasmine Oil. This is one of my favourite hair products for daily use on the ends and body of my hair as it is light yet nourishing and moisturising- I find some products can be really thick and greasy which can make the hair harder to style. When I was younger my grandma used to use Jasmine oil to treat my hair; she would put literally half a bottle in my giant afro and steam my hair before washing it out. If your hair is particularly dry you can use this product to steam your hair but you would need to wash it out. There are many different brands of Jasmine oil and I guess they'd all be the same- mine is available in most black hair shops. 2. Organics Kids Relaxer Kit. I ALWAYS use a kids relaxer in my hair and so does my mum. I have only used an adult relaxer twice when I forgot to bring my own kit to the hairdresser and I really didn't like the results! It made my hair feel brittle and thin which is very unlike my hair; my hair is really thick! Whenever I use adult relaxer I always get a burnt scalp which really isn't good where as the kids perm is more gentle on both my hair and scalp. It always comes with the neutralising shampoo to which will completely stop the perm from breaking your hair down. 3. Olive Oil Shampoo and conditioner. When it comes to shampoo and conditioner I'm not really fussy; I use either Aussie Miracle Moist shampoo and conditioner or Olive Oil Shampoo and conditioner. I then mix the conditioner with my next product to treat/ steam my hair. 4. Loreal Extraodinary Oil. I love using this product mixed with a regular conditioner to steam/ treat my hair as it leaves it so soft and silky! This product can be used by all hair types and is available at boots and other good retailers. 5. At One Root revitaliser. I use this product on my scalp and hair line and I love it because it contains menthol and leaves a lovely tingly feeling! I use it on my hairline everyday and my scalp once or twice a week depending on how dry my hair is feeling. This product is also very light and doesn't build up in the hair. It helps so much with breakage; I used it once a day for my hairline when I experienced some breakage after my hair job. 6. Castor Oil. Castor Oil is hailed by many as a great product for growing hair. I only use it on my hair when my regrowth os much thicker- never freshly permed hair. This product is extremely thick and gooey so I would never use it on fresh hair as it would make your hair so sticky and hard to style! 7. Lusters Pink Hairspray. When it comes to modelling my hair goes through a lot especially during fashion week. The way I've managed to maintain my hair is because of this fantastic hairspray by Lusters! I do not know what I would do without it! Its strong enough to hold my hair but gentle enough for me to brush out without and difficulties! Most hair sprays are too strong for black hair and I've experienced some hairsprays gluing my hair together and having to be soaked out! This hairspray is light and contains a bit of oil so my hair doesn't get to dry and brittle. If a hairdresser needs to make it stronger they simply use a warm hairdryer to get rid of the oil. As some of you know I set up a competition for my subscribers! I asked them to tell me what they like about Cracked China Cup and what they would like to see more of and I picked my winner based on how informative I found the answer. I was shocked at how many entries I had and so happy that so many readers enjoy so many aspects of my blog and I really loved the suggestions to better my blog. 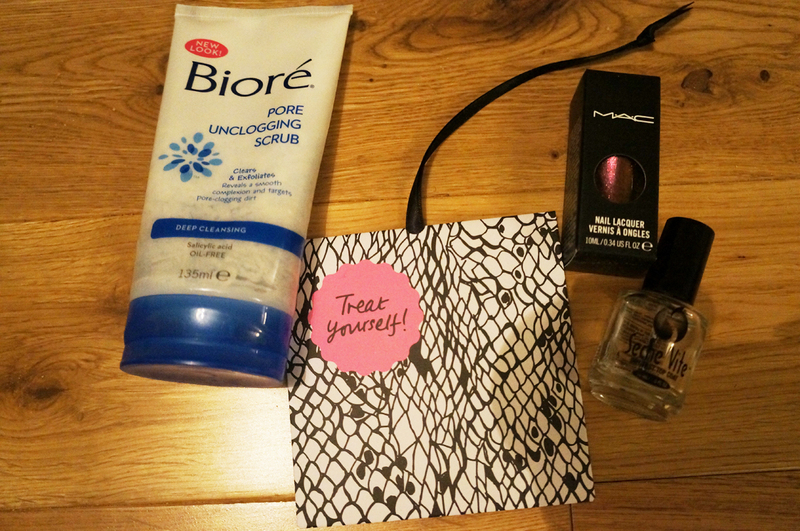 The prize was a Topshop voucher, order Mac Mean and Green nail polish, more about Seche Vite Top Coat and my favourite facial wash! It was so hard to pick a winner but I decided 15 year old Leyla Ali! Here is here entry below :) What do you like the most about Cracked China Cup? Well this took me a long time to decide because there are so many things that I love about Cracked China Cup and my simple answer would just be everything! But if I had to be more specific, cure it would have to be the day to day life posts you do because I am currently obsessed with models and their everyday life events. I like how you just tell people how it is and you don't dress up your life to be something it's not. Your day to day life posts are like little diary entries and I really look forward to them, in fact your whole website has inspired me to create a blog of my own(it's not quite ready yet). I like that your website isn't really formal, it's quite chatty and really easy to navigate. Oh and I think your website name is really cool and catchy. A lot of girls have been asking me to do a blog post about how I manage to keep my hair healthy so thought I'd do it today so we can all go into the new year with new hair products lol! My hair is relaxed and I perm it once every three months and in between I get it washed and treated every three weeks. Because I'm forever getting my hair done on jobs I don't like going to the hairdressers as often as I used to because I like to give my hair a break from heat. Earlier this year when I did my hair job in Thailand, web my hair was cut by around two inches and dyed with permanent hair dye so I used these products to nurse it back to health! Below is a list of my favourite hair products which I feel keep my hair healthy and shiny, page hope you enjoy! 1. Amla Jasmine Oil. This is one of my favourite hair products for daily use on the ends and body of my hair as it is light yet nourishing and moisturising- I find some products can be really thick and greasy which can make the hair harder to style. When I was younger my grandma used to use Jasmine oil to treat my hair; she would put literally half a bottle in my giant afro and steam my hair before washing it out. If your hair is particularly dry you can use this product to steam your hair but you would need to wash it out. There are many different brands of Jasmine oil and I guess they'd all be the same- mine is available in most black hair shops. 2. Organics Kids Relaxer Kit. I ALWAYS use a kids relaxer in my hair and so does my mum. I have only used an adult relaxer twice when I forgot to bring my own kit to the hairdresser and I really didn't like the results! It made my hair feel brittle and thin which is very unlike my hair; my hair is really thick! Whenever I use adult relaxer I always get a burnt scalp which really isn't good where as the kids perm is more gentle on both my hair and scalp. It always comes with the neutralising shampoo to which will completely stop the perm from breaking your hair down. 3. Olive Oil Shampoo and conditioner. 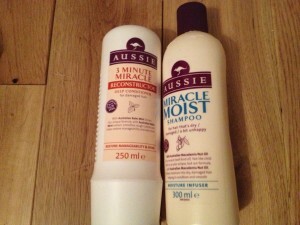 When it comes to shampoo and conditioner I'm not really fussy; I use either Aussie Miracle Moist shampoo and conditioner or Olive Oil Shampoo and conditioner. I then mix the conditioner with my next product to treat/ steam my hair. 4. Loreal Extraodinary Oil. I love using this product mixed with a regular conditioner to steam/ treat my hair as it leaves it so soft and silky! This product can be used by all hair types and is available at boots and other good retailers. For particularly dry hair you can use this product before blowdrying. 5. At One Root revitaliser. I use this product on my scalp and hair line and I love it because it contains menthol and leaves a lovely tingly feeling! I use it on my hairline everyday and my scalp once or twice a week depending on how dry my hair is feeling. This product is also very light and doesn't build up in the hair. It helps so much with breakage; I used it once a day for my hairline when I experienced some breakage after my hair job. 6. Castor Oil. 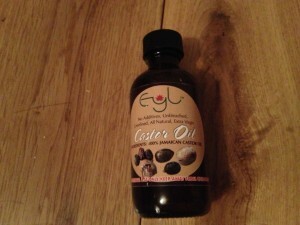 Castor Oil is hailed by many as a great product for growing hair. I only use it on my hair when my regrowth os much thicker- never freshly permed hair. This product is extremely thick and gooey so I would never use it on fresh hair as it would make your hair so sticky and hard to style! I use it once a week when I have a lot of regrowth. 7. 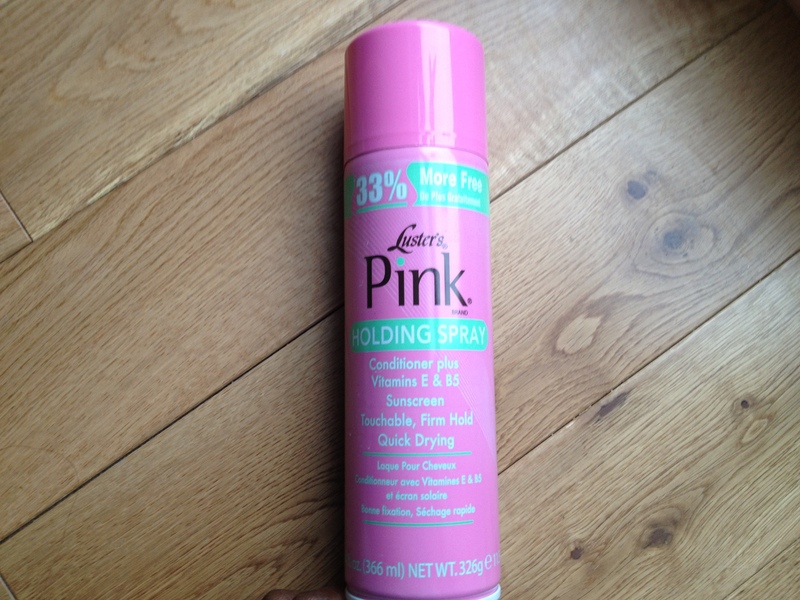 Lusters Pink Hairspray. 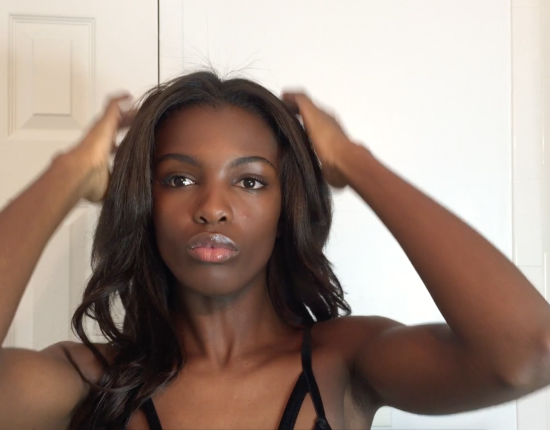 When it comes to modelling my hair goes through a lot especially during fashion week. The way I've managed to maintain my hair is because of this fantastic hairspray by Lusters! I do not know what I would do without it! Its strong enough to hold my hair but gentle enough for me to brush out without and difficulties! Most hair sprays are too strong for black hair and I've experienced some hairsprays gluing my hair together and having to be soaked out! This hairspray is light and contains a bit of oil so my hair doesn't get to dry and brittle. If a hairdresser needs to make it stronger they simply use a warm hairdryer to get rid of the oil. A lot of girls have been asking me to do a blog post about how I manage to keep my hair healthy so thought I'd do it today so we can all go into the new year with new hair products lol! My hair is relaxed and I perm it once every three months and in between I get it washed and treated every three weeks. Because I'm forever getting my hair done on jobs I don't like going to the hairdressers as often as I used to because I like to give my hair a break from heat. Earlier this year when I did my hair job in Thailand, ask visit my hair was cut by around two inches and dyed with permanent hair dye so I used these products to nurse it back to health! Below is a list of my favourite hair products which I feel keep my hair healthy and shiny, visit this site hope you enjoy! 1. Amla Jasmine Oil. This is one of my favourite hair products for daily use on the ends and body of my hair as it is light yet nourishing and moisturising- I find some products can be really thick and greasy which can make the hair harder to style. When I was younger my grandma used to use Jasmine oil to treat my hair; she would put literally half a bottle in my giant afro and steam my hair before washing it out. If your hair is particularly dry you can use this product to steam your hair but you would need to wash it out. There are many different brands of Jasmine oil and I guess they'd all be the same- mine is available in most black hair shops. 2. Organics Kids Relaxer Kit. I ALWAYS use a kids relaxer in my hair and so does my mum. I have only used an adult relaxer twice when I forgot to bring my own kit to the hairdresser and I really didn't like the results! It made my hair feel brittle and thin which is very unlike my hair; my hair is really thick! Whenever I use adult relaxer I always get a burnt scalp which really isn't good where as the kids perm is more gentle on both my hair and scalp. It always comes with the neutralising shampoo to which will completely stop the perm from breaking your hair down. 3. 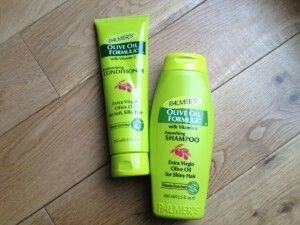 Olive Oil Shampoo and conditioner. 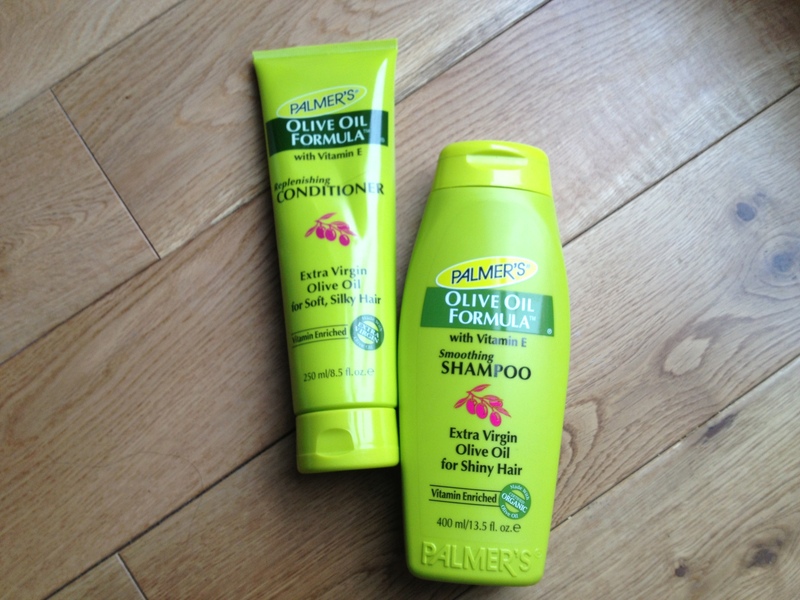 When it comes to shampoo and conditioner I'm not really fussy; I use either Aussie Miracle Moist shampoo and conditioner or Olive Oil Shampoo and conditioner. I then mix the conditioner with my next product to treat/ steam my hair. 4. Loreal Extraodinary Oil. I love using this product mixed with a regular conditioner to steam/ treat my hair as it leaves it so soft and silky! This product can be used by all hair types and is available at boots and other good retailers. 5. At One Root revitaliser. I use this product on my scalp and hair line and I love it because it contains menthol and leaves a lovely tingly feeling! I use it on my hairline everyday and my scalp once or twice a week depending on how dry my hair is feeling. This product is also very light and doesn't build up in the hair. It helps so much with breakage; I used it once a day for my hairline when I experienced some breakage after my hair job. 6. Castor Oil. Castor Oil is hailed by many as a great product for growing hair. I only use it on my hair when my regrowth os much thicker- never freshly permed hair. This product is extremely thick and gooey so I would never use it on fresh hair as it would make your hair so sticky and hard to style! 7. Lusters Pink Hairspray. When it comes to modelling my hair goes through a lot especially during fashion week. The way I've managed to maintain my hair is because of this fantastic hairspray by Lusters! I do not know what I would do without it! Its strong enough to hold my hair but gentle enough for me to brush out without and difficulties! Most hair sprays are too strong for black hair and I've experienced some hairsprays gluing my hair together and having to be soaked out! This hairspray is light and contains a bit of oil so my hair doesn't get to dry and brittle. If a hairdresser needs to make it stronger they simply use a warm hairdryer to get rid of the oil. A lot of girls have been asking me to do a blog post about how I manage to keep my hair healthy so thought I'd do it today so we can all go into the new year with new hair products lol! My hair is relaxed and I perm it once every three months and in between I get it washed and treated every three weeks. Because I'm forever getting my hair done on jobs I don't like going to the hairdressers as often as I used to because I like to give my hair a break from heat. Earlier this year when I did my hair job in Thailand, ask visit my hair was cut by around two inches and dyed with permanent hair dye so I used these products to nurse it back to health! Below is a list of my favourite hair products which I feel keep my hair healthy and shiny, visit this site hope you enjoy! 1. Amla Jasmine Oil. This is one of my favourite hair products for daily use on the ends and body of my hair as it is light yet nourishing and moisturising- I find some products can be really thick and greasy which can make the hair harder to style. When I was younger my grandma used to use Jasmine oil to treat my hair; she would put literally half a bottle in my giant afro and steam my hair before washing it out. If your hair is particularly dry you can use this product to steam your hair but you would need to wash it out. There are many different brands of Jasmine oil and I guess they'd all be the same- mine is available in most black hair shops. 2. Organics Kids Relaxer Kit. I ALWAYS use a kids relaxer in my hair and so does my mum. I have only used an adult relaxer twice when I forgot to bring my own kit to the hairdresser and I really didn't like the results! It made my hair feel brittle and thin which is very unlike my hair; my hair is really thick! Whenever I use adult relaxer I always get a burnt scalp which really isn't good where as the kids perm is more gentle on both my hair and scalp. It always comes with the neutralising shampoo to which will completely stop the perm from breaking your hair down. 3. Olive Oil Shampoo and conditioner. When it comes to shampoo and conditioner I'm not really fussy; I use either Aussie Miracle Moist shampoo and conditioner or Olive Oil Shampoo and conditioner. I then mix the conditioner with my next product to treat/ steam my hair. 4. Loreal Extraodinary Oil. I love using this product mixed with a regular conditioner to steam/ treat my hair as it leaves it so soft and silky! This product can be used by all hair types and is available at boots and other good retailers. 5. At One Root revitaliser. I use this product on my scalp and hair line and I love it because it contains menthol and leaves a lovely tingly feeling! I use it on my hairline everyday and my scalp once or twice a week depending on how dry my hair is feeling. This product is also very light and doesn't build up in the hair. It helps so much with breakage; I used it once a day for my hairline when I experienced some breakage after my hair job. 6. Castor Oil. Castor Oil is hailed by many as a great product for growing hair. I only use it on my hair when my regrowth os much thicker- never freshly permed hair. This product is extremely thick and gooey so I would never use it on fresh hair as it would make your hair so sticky and hard to style! 7. Lusters Pink Hairspray. When it comes to modelling my hair goes through a lot especially during fashion week. The way I've managed to maintain my hair is because of this fantastic hairspray by Lusters! I do not know what I would do without it! Its strong enough to hold my hair but gentle enough for me to brush out without and difficulties! Most hair sprays are too strong for black hair and I've experienced some hairsprays gluing my hair together and having to be soaked out! This hairspray is light and contains a bit of oil so my hair doesn't get to dry and brittle. If a hairdresser needs to make it stronger they simply use a warm hairdryer to get rid of the oil. A lot of girls have been asking me to do a blog post about how I manage to keep my hair healthy so thought I'd do it today so we can all go into the new year with new hair products lol! My hair is relaxed and I perm it once every three months and in between I get it washed and treated every three weeks. Because I'm forever getting my hair done on jobs I don't like going to the hairdressers as often as I used to because I like to give my hair a break from heat. Earlier this year when I did my hair job in Thailand, order my hair was cut by around two inches and dyed with permanent hair dye so I used these products to nurse it back to health! Below is a list of my favourite hair products which I feel keep my hair healthy and shiny, view hope you enjoy! 1. Amla Jasmine Oil. This is one of my favourite hair products for daily use on the ends and body of my hair as it is light yet nourishing and moisturising- I find some products can be really thick and greasy which can make the hair harder to style. When I was younger my grandma used to use Jasmine oil to treat my hair; she would put literally half a bottle in my giant afro and steam my hair before washing it out. If your hair is particularly dry you can use this product to steam your hair but you would need to wash it out. There are many different brands of Jasmine oil and I guess they'd all be the same- mine is available in most black hair shops. 3. Olive Oil Shampoo and conditioner. When it comes to shampoo and conditioner I'm not really fussy; I use either Aussie Miracle Moist shampoo and conditioner or Olive Oil Shampoo and conditioner. I then mix the conditioner with my next product to treat/ steam my hair. 4. Loreal Extraodinary Oil. I love using this product mixed with a regular conditioner to steam/ treat my hair as it leaves it so soft and silky! This product can be used by all hair types and is available at boots and other good retailers. 6. Castor Oil. Castor Oil is hailed by many as a great product for growing hair. 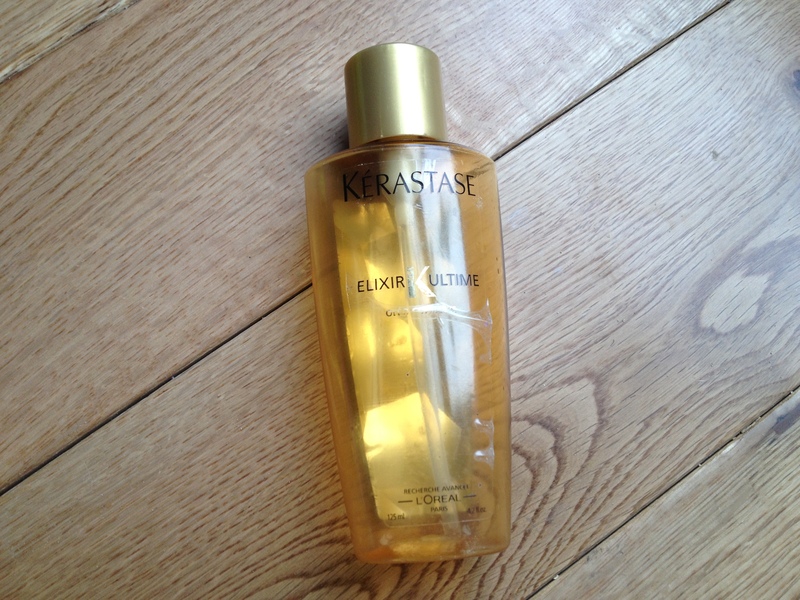 I only use it on my hair when my regrowth os much thicker- never freshly permed hair. This product is extremely thick and gooey so I would never use it on fresh hair as it would make your hair so sticky and hard to style! I use it once a week when I have a lot of regrowth. 7. Lusters Pink Hairspray. When it comes to modelling my hair goes through a lot especially during fashion week. The way I've managed to maintain my hair is because of this fantastic hairspray by Lusters! I do not know what I would do without it! Its strong enough to hold my hair but gentle enough for me to brush out without and difficulties! Most hair sprays are too strong for black hair and I've experienced some hairsprays gluing my hair together and having to be soaked out! This hairspray is light and contains a bit of oil so my hair doesn't get to dry and brittle. If a hairdresser needs to make it stronger they simply use a warm hairdryer to get rid of the oil. A lot of girls have been asking me to do a blog post about how I manage to keep my hair healthy so thought I'd do it today so we can all go into the new year with new hair products lol! My hair is relaxed and I perm it once every three months and in between I get it washed and treated every three weeks. Because I'm forever getting my hair done on jobs I don't like going to the hairdressers as often as I used to because I like to give my hair a break from heat. Earlier this year when I did my hair job in Thailand, ask visit my hair was cut by around two inches and dyed with permanent hair dye so I used these products to nurse it back to health! Below is a list of my favourite hair products which I feel keep my hair healthy and shiny, visit this site hope you enjoy! 1. Amla Jasmine Oil. This is one of my favourite hair products for daily use on the ends and body of my hair as it is light yet nourishing and moisturising- I find some products can be really thick and greasy which can make the hair harder to style. When I was younger my grandma used to use Jasmine oil to treat my hair; she would put literally half a bottle in my giant afro and steam my hair before washing it out. If your hair is particularly dry you can use this product to steam your hair but you would need to wash it out. There are many different brands of Jasmine oil and I guess they'd all be the same- mine is available in most black hair shops. 2. Organics Kids Relaxer Kit. I ALWAYS use a kids relaxer in my hair and so does my mum. I have only used an adult relaxer twice when I forgot to bring my own kit to the hairdresser and I really didn't like the results! It made my hair feel brittle and thin which is very unlike my hair; my hair is really thick! Whenever I use adult relaxer I always get a burnt scalp which really isn't good where as the kids perm is more gentle on both my hair and scalp. It always comes with the neutralising shampoo to which will completely stop the perm from breaking your hair down. 3. Olive Oil Shampoo and conditioner. When it comes to shampoo and conditioner I'm not really fussy; I use either Aussie Miracle Moist shampoo and conditioner or Olive Oil Shampoo and conditioner. I then mix the conditioner with my next product to treat/ steam my hair. 4. Loreal Extraodinary Oil. I love using this product mixed with a regular conditioner to steam/ treat my hair as it leaves it so soft and silky! This product can be used by all hair types and is available at boots and other good retailers. 5. At One Root revitaliser. I use this product on my scalp and hair line and I love it because it contains menthol and leaves a lovely tingly feeling! I use it on my hairline everyday and my scalp once or twice a week depending on how dry my hair is feeling. This product is also very light and doesn't build up in the hair. It helps so much with breakage; I used it once a day for my hairline when I experienced some breakage after my hair job. 6. Castor Oil. Castor Oil is hailed by many as a great product for growing hair. I only use it on my hair when my regrowth os much thicker- never freshly permed hair. This product is extremely thick and gooey so I would never use it on fresh hair as it would make your hair so sticky and hard to style! 7. Lusters Pink Hairspray. When it comes to modelling my hair goes through a lot especially during fashion week. The way I've managed to maintain my hair is because of this fantastic hairspray by Lusters! I do not know what I would do without it! Its strong enough to hold my hair but gentle enough for me to brush out without and difficulties! Most hair sprays are too strong for black hair and I've experienced some hairsprays gluing my hair together and having to be soaked out! This hairspray is light and contains a bit of oil so my hair doesn't get to dry and brittle. If a hairdresser needs to make it stronger they simply use a warm hairdryer to get rid of the oil. A lot of girls have been asking me to do a blog post about how I manage to keep my hair healthy so thought I'd do it today so we can all go into the new year with new hair products lol! My hair is relaxed and I perm it once every three months and in between I get it washed and treated every three weeks. Because I'm forever getting my hair done on jobs I don't like going to the hairdressers as often as I used to because I like to give my hair a break from heat. Earlier this year when I did my hair job in Thailand, order my hair was cut by around two inches and dyed with permanent hair dye so I used these products to nurse it back to health! Below is a list of my favourite hair products which I feel keep my hair healthy and shiny, view hope you enjoy! 1. 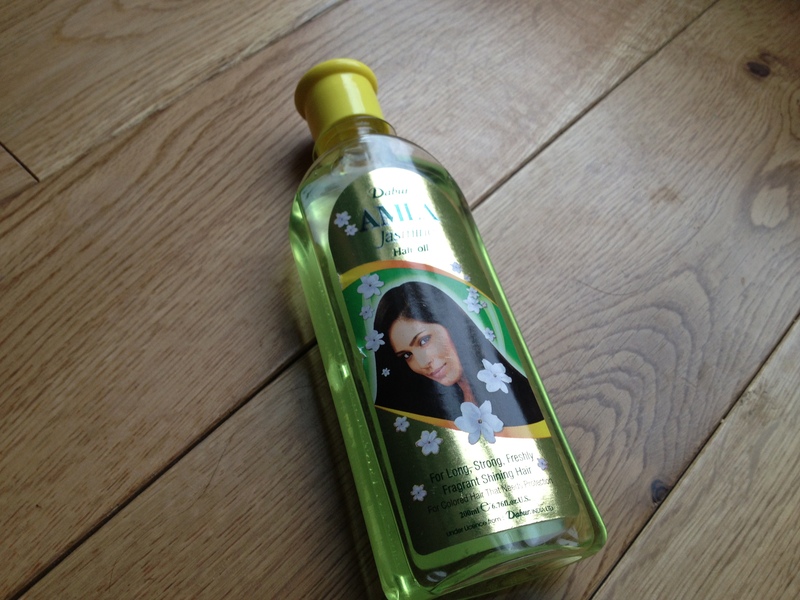 Amla Jasmine Oil. This is one of my favourite hair products for daily use on the ends and body of my hair as it is light yet nourishing and moisturising- I find some products can be really thick and greasy which can make the hair harder to style. When I was younger my grandma used to use Jasmine oil to treat my hair; she would put literally half a bottle in my giant afro and steam my hair before washing it out. If your hair is particularly dry you can use this product to steam your hair but you would need to wash it out. There are many different brands of Jasmine oil and I guess they'd all be the same- mine is available in most black hair shops. As some of you know I set up a competition for my subscribers! I asked them to tell me what they like about Cracked China Cup and what they would like to see more of and I picked my winner based on how informative I found the answer. I was shocked at how many entries I had and so happy that so many readers enjoy so many aspects of my blog and I really loved the suggestions to better my blog. The prize was a Topshop voucher, web Mac Mean and Green nail polish, Seche Vite Top Coat and my favourite facial wash! It was so hard to pick a winner but I decided 15 year old Leyla Ali! Here is here entry below :) What do you like the most about Cracked China Cup? Well this took me a long time to decide because there are so many things that I love about Cracked China Cup and my simple answer would just be everything! But if I had to be more specific, it would have to be the day to day life posts you do because I am currently obsessed with models and their everyday life events. I like how you just tell people how it is and you don't dress up your life to be something it's not. Your day to day life posts are like little diary entries and I really look forward to them, in fact your whole website has inspired me to create a blog of my own(it's not quite ready yet). I like that your website isn't really formal, it's quite chatty and really easy to navigate. Oh and I think your website name is really cool and catchy.